The province of Cadiz, in southwest Spain, is liberally sprinkled with ‘Frontier’ towns, whose roots date from Islamic times. With narrow, cobbled streets, historic buildings and white washed houses, these old towns were established by the Christians many centuries ago to defend Spain from the Moors. Upon the hilltops, with their scenic views, these strategically placed towns are easily reached by car and are a delight to explore on foot. On arrival at Seville airport collect your hire car and self drive (c.1 hour 30 minutes) to the Parador in Arcos de la Frontera. The Parador enjoys an enviable position, at the top of the historic hilltop town of Arcos, with spectacular views over the plains and Guadalete River below. Access to Cabildo Square, where the Parador is situated, is via narrow cobbled roads and although parking is limited, the hotel reception will be able to offer advice on alternative parking options. Overnight at the Parador de Arcos, Andalucia. Spend the day exploring Arcos de la Frontera starting at Plaza Cabildo, the heart of the old town, with its panoramic viewpoint and impressive church of Santa Maria de la Asuncion. Alternatively, head further afield to Jimena de la Frontera (c.2 hours). The drive takes you via country roads, through the Natural Park of Alcornocales. Jimena de la Frontera itself boasts a Moorish castle where, on a clear day, the views from its vantage point above the town are breathtaking. 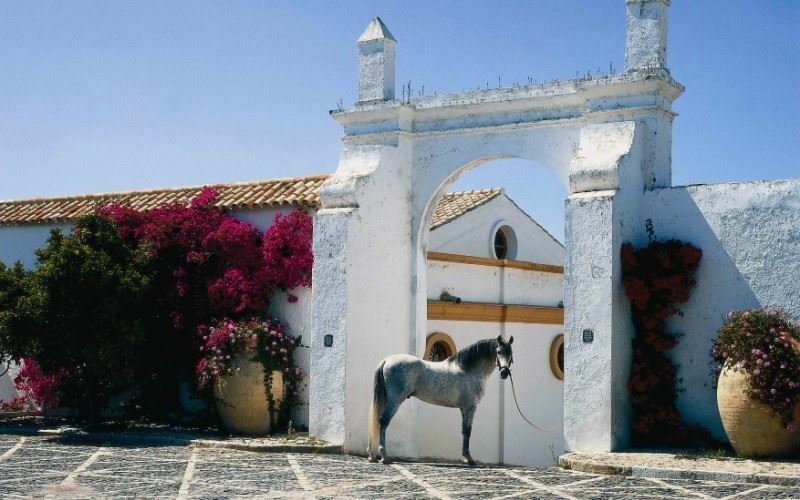 After breakfast, drive to Casa Shelly Hospederia in Vejer de la Frontera (c.1 hour 15 minutes), located in the historic pedestrianised centre (free parking is available on the outskirts of town). Vejer has a Moorish feel and retains much of its 15th century walls. Narrow cobbled streets, a castle with its small museum, two surviving original gateways, the ‘Divino Salvador’ church, a Jewish quarter and the Plaza de España – Vejer’s pretty main square, are some of the many gems to be seen here. Overnight at the Casa Shelly Hospederia, Andalucia. Vejer is in the Costa de la Luz (Coast of Light) area of Spain, an area renowned for its spectacular unspoilt beaches which are within easy reach. Conil de la Frontera, on the Costa de la Luz, is a beach town south of Cadiz and is popular with tourists due to its atmospheric evenings. Although not best known for its monuments, there are a few which can still be seen in the old town. Slightly more inland, on a hill, you will find Chiclana de la Frontera, a historic town dating from 1303. Famous for its dolls, it is home to what is believed to be the oldest doll factory in the country – La Fábrica Museo de Muñecos Marín. Today, depart Vejer de la Frontera and drive to the city of Jerez de la Frontera (c.1 hour), to the Villa Jerez Hotel. Once a private residence to a sherry dynasty, the hotel is located within easy reach of the old walled town of Jerez (c.15 minute walk) and offers free parking. The famous Spanish riding school, one of the highlights of the city, is nearby and performances take place twice weekly (Tuesdays and Thursdays). Overnight at the Villa Jerez Hotel, Andalucia. Jerez de la Frontera is famous for its sherry and flamenco. Throughout the city you will find ‘bodegas’ open to the public, where it is possible to view how this fortified wine is made as well as partake in some sherry tasting. Flamenco can be seen, and most importantly felt, in some of the ‘Tabancos’ in Jerez, with regular events taking place. Wander around the city, there is so much to see – the imposing Alcázar de Jerez, the cathedral, the 15th century Church of Santiago and picturesque squares filled with cafés, serving delicious tapas - to name but a few. Spend your last day re-visiting your favourite site or head to Calle Larga for a spot of shopping. This popular and long semi-pedestrian historic street has some of the best shops in the city. Or for a spot of pampering, seek out the Hammam (Arab Baths). After breakfast, drive to Seville airport (c.1 hour 15 minutes) for your return flight to the UK. Nestling in one of Vejer’s narrow streets, within the ancient walls, is this absolutely charming, tastefully renovated, owner-managed guesthouse, worthy of five-star status. Built in 1955 as a private residence of the Domecq family, sherry dynasty, the property is set back from the wide avenue leading into Jerez and is approached via a wide drive fringed with ornamental gardens. Built in 1955 as a private residence of the Domecq family, sherry dynasty, the property is set back from the wide avenue leading into Jerez and is approached via a wide drive fringed with ornamental gardens. The walled old town of Jerez is a 15 minute walk or a short taxi ride away. This magnificent lemon coloured, classic, hacienda style mansion set in 4,000sqm of landscaped gardens is an ideal country retreat from which to visit the delightful town of Jerez. It is located within a few minutes walk of the world famous Spanish riding school and is an ideal base from which to view the performances that take place on Tuesdays and Thursdays. The hotel still feels like a home and prides itself on its personal service.